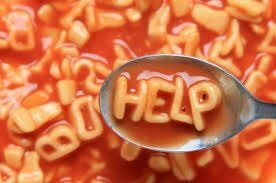 When a normal person hears the words “alphabet soup” they probably think of the kind you eat with the little noodles shaped like letters. When a voiceover person hear the words “alphabet soup” it means that their mouth is going to be filled with lots of acronyms. One of the things that endears a voice talent to clients is a talent’s ability to see past the noodles in this word soup and find the broth. This doesn’t necessarily mean understanding every word that is spoken, but it does mean understanding the context and how the words relate to each other. It helps to have a little bit of understanding about a LOT of stuff. For voice talent who do marketing pieces, informational and corporate communications work – we see scripts for IT, healthcare, the financial business, the military or the government and many other types of industries. I did a long piece recently for a municipal building project that spoke to the prime contractors about their required paperwork at every step of the project. Another large project was for a government agency website describing every department within the agency in minute detail. We need to see past the word soup and understand the message so that we can hear when something just doesn’t sound “right” during the recording. Many scripts are not written by scriptwriters, so the words may have never actually been spoken aloud. Sometimes a script is written by an experienced white paper writer, or annual report writer. These are words that are written for the eye and not the ear. Long sentences with multiple compound phrases. Experienced talent can parse through the words and generally get the message across in their delivery. Knowing who will be seeing or hearing the presentation is helpful, too – along with understanding what is new information for the audience and what they might already be familiar with. An experienced talent will know when to ask questions so that the message doesn’t get lost along the way. I had a script today with several newly invented acronyms which referred to other newly invented acronyms about a subject that I am not completely familiar with. But familiar enough to get to the flavor of the story I was telling. That is my job. I have to look past the noodles and concentrate on the soup. Improv and Successful Voiceover Work? I have long been told (and even suggest it myself) that Improv is a great training ground for voiceover pros. Instinctively I think I knew this to be true. But I have never been able to really articulate exactly why. Edge Studio published an article by Vanessa Richardson that finally clarified it for me. Spontaneity is the word I have been using when thinking and talking about what Improv training will do to help improve delivery of a script, but it goes deeper than just being spontaneous. This doesn’t really explain what is actually happening in Improv and how it might relate to reading a script. It gets more confusing because the word improvise is defined as doing something without preparation. We all improvise. Every day, all day, we move through our days with little acts of improvisation. For most people, we do not have a script written each morning that details our conversations and interactions. The improv we do here may or may not be good improv. It may or may not be funny (which is not necessary for improv). But even if it is funny, the simple act of making the mail carrier laugh because of a witty response to the garden hose bursting and both of us getting soaked is not going to bring in the paying crowds. – Good Improv isn’t scripted, but it is backed by lots and lots of preparation. – Voiceover work is scripted and often times performed with very little preparation. In our everyday lives, we all need to listen, being aware of our surroundings and open to a change in direction. This is a key reason why (as actors such as Meryl Streep have long advised), listening is at the core of acting. Listen to the other actor. (Or if you prefer, your character should listen to the other character.) Even when you’re working solo, listen to yourself. Also listen to your producer, director or client. They are, in effect, your scene partner. The better you listen and are able to take direction in a relaxed and positive manner, the more able you are to make them look good. As a voice talent, reading from someone else’s script (usually all by myself), it is my job to get inside the head of the other person listening to this “conversation” and – in the way I deliver the story – let their part of the conversation connect with my part of the conversation. Read the rest of the article for more insight into how Improv and the art of listening and reacting spontaneously can help improve your performance when reading a script. One of the things that a professional voice talent MUST have to succeed is the ability to self-direct. We do so much of our work – at least initially (and in many cases most of our work) – alone. Alone with our doubts, our insecurities, our patterns. When we are auditioning, the ability to self-direct can be the determining factor in getting the gig. We don’t want to send out the “same” read that 95% of the rest of the talent is submitting. We want our audition to leap off the mp3 and straight into the “book that talent” column. Last year, I tried my hand at fiction audio books for the first time. I am finishing up the 3rd. And while the verdict is still out on if I actually like this area of voice work, I have greatly enjoyed the process. Discovering how much time it REALLY takes. Is it better to have a proofer and an editor – or some combination of both? Do I like the stipend with royalty option, or just the royalty, or just a flat fee. The first book was entirely self-produced – $100 pfh (per finished hour) stipend, plus royalties. It is coming up on a year since the book was released and the pfh has bumped up to about $175 pfh. The second book I did was a fluffly little Harlequin romance with a pfh of around $125 – but I didn’t have to do the proofing or the editing. No royalties on this one though, so the one check is the only check I’ll be getting for that one. I have 3 more chapters to go on the third book – a sweet southern story with a stipend of $150 pfh, plus royalties. So far I am self-producing this one. I sort of liked the team approach, but at the same time, I am used to doing everything myself – the artistic and the technical. I could be persuaded to hand off the technical, but the artistic is all in my hands. That part of the project is almost entirely in our hands. No one is listening to me as I read page after page – chapter after chapter. And technique is defined as an actable performance tool whose purpose is to cause compelling storytelling. In this article, he is interviewing his co-director – himself – who details 7 Directions that he gives – uh – himself – when working his way through the story. Here they are in a nutshell – you’ll have to read the article to get the details. Verbalize feeling; Hold back; Flat; Less; Big; Dispassionately teach, passionately; Up the stakes! If you record audio books – this is a must read. And I know that my co-director will be barking out a few of these orders as I finish up the last three chapters of the Tea-Olive Bird Watching Society. One of the things that separates a voiceover actor from a theater or film actor is memorization. In VO, we don’t have to memorize. While both are “acting,” the techniques are different. And one of the reasons why not all good stage or film actors can make the transition to VO. And vice versa. I love the fact that I don’t have to memorize. It goes in my eyeballs, rolls around in my brain for a little while, out my mouth and then it is gone. Sometimes I can’t even tell you what I did yesterday! When I was doing on-camera work as a spokesperson, I used teleprompter or ear-prompter, so I wasn’t memorizing either. But a dozen or so years ago, I auditioned for a live “radio show” that was going to be done on stage. After the run, I had been bitten by the “acting” bug. It was wonderful to actually feel the the audience. As a voice talent, I do so much of my work alone in my studio with no one listening. You don’t hear people laugh, clap, hoot, or cough – or hearing aides squeal. The closest you come in VO is being in a studio or ISDN session. There at least you get response and interaction. So, after the run of the “radio play,” I auditioned for a show that consisted of several short plays. I was cast in two of them and suddenly had to memorize! And so I did. And that play led to another and another and another. Right now I am in the last two weeks of rehearsal before “Vanished” opens here in San Diego. My techniques for memorizing have advanced over the years as I incorporated some of my voiceover tools to help. I record my scenes reading all the parts. Then I silence all my parts and save the scenes as separate files. I save all of the files on a CD or in my phone and listen and talk back as I go about my daily tasks. As I learn the lines, I test myself by listening only to the tracks without my lines. If I hesitate, then I can go back to the tracks with my lines and remind myself of what the playwright actually wrote. So, as we go into the last two weeks of rehearsal, I only have a couple of little spots where the right words are not flowing, but I know where they are. And the ability to memorize can be incorporated into my voiceover business. There are times when just a little bit of memorizing can help you get off the page and bring a little bit more you to the project. I’m thrilled and a bit scared to see that a documentary on cartoon voice actors is in production. Thrilled, because I know a few of the people in the film personally – one of whom was actually my agent way back in the 80’s before she moved to Hanna-Barbara – Andrea Romano. Scared because it is more exposure to the business of voice acting – which will probably inspire more and more people to give up their day jobs to try to become a voiceover actor. So they will seek out advice – many asking far too many questions that will point out that they have nary a clue how to use Google to find the basic answers so that they can craft answerable questions. I have included both trailers. The first one embedded here is lots of fun – but look just below for the other trailer. If you are one of those who have always made your friends laugh with your impersonations of cartoon characters – really listen to what the actors are saying in that first trailer. It isn’t about silly voices. The other day I had three sessions in a row with repeat clients for whom my delivery is just slightly different. Pacing, placement, energy, warmth, etc. just a bit different for each project. One client found me 3 or 4 years ago because they had lost track of the voice they had been using and wanted a voice match. Actually, they THOUGHT I was the same person and after I told them that I wasn’t, they asked me if I could match a sample they provided. I did and we have been doing updates every 5 months or so. This voice is in a slightly different place in my head than my usual signature sound. Another project was 3 word changes and a new paragraph for a project originally completed about a year and a half ago. The read on this was soft and comforting. And the third project that day was the 4th iteration of an eLearning project where I needed to match the other half-dozen projects for the same company in brisk tone and perkiness. I keep everything in folders on my hard drive of course, just for times such as these. All it takes is a 2 or 3 second listen to what we did before and I slip right into that particular zone. Most of us do this, of course. Really – it’s simply part of our jobs. Something we need to do to keep our customers happy. Remarkable only in the fact that it was three repeat clients with three different approaches. I just sort of fell into the voiceover business. I really didn’t have any training. No school of broadcasting. No acting classes (well, none since the 2nd grade). But I had done a bit of radio in college and that led to some staff announcing while I was in grad school. Grad school led to a job in a TV station, first as a director, then, after deciding that was something that I didn’t want to do for the rest of my life, as a staff announcer. A live staff announcer. A live staff announcer who didn’t sound like a typical announcer – so the door to my little closet-sized booth would open on a regular basis with people handing me commercial copy. After a period of time, I decided that I might need to learn a bit more about this voiceover stuff – and bought my first book – “Word of Mouth” by Susan Blu and Molly Ann Mullin. That edition was was originally published in 1987 and was instrumental in giving me a good swift kick in the pants to propel me to new heights of voiceover work. Suddenly, my world of voiceover was transformed – I started to critically dissect the copy and figure out who I was supposed to be as I delivered the copy. I did a lot of this intuitively, or I wouldn’t have been getting repeat business, but being able to actually identify the elements of what I was doing was helpful in moving me forward. Much of that book is still relevant today. The link above is to the latest edition. I now have a shelf full of voiceover books. Many of the books say much the same thing about breaking down a character or a script, but each does it in their own “voice.” Many of the books use techniques from some of the same well known voice actors and voice over teachers. Each book has merit and if you have some extra cash, pick up copies of as many of them as you have time to read. You can get them used. If you are looking for a well organized, thoughtful, easy to understand book on the voiceover business, filled with practical examples of scripts of every variety – from commercials to audiobooks – from corporate communication to video games, this is the book to have on your shelf. It takes you through the basics of the business – from technical to techniques – for the beginner and the seasoned pro. Then be prepared for a workout! It is packed with scripts and more scripts – with analysis that even a professional can appreciate. And finally, no matter how much know about the business or how much you practice – if you don’t know how to hook up with the people who want to buy what you have to sell, then you won’t be making a living in this business. This part of the book is actually the hardest for most people – and the part that is often left out of voiceover classes. In this era of recording in a vacuum, the more we know what works and how to hear what works when we do it, the more often we will find a way of connecting with and delivering the copy – a read that clicks with the producer listening to the auditions. And sometimes – beginner or pro – we get into a rut and need that kick in the pants. This book is a good one for doing just that – in friendly, easy to understand prose. Conversational Read? Sure – What Flavor? We get it all the time in casting directions these days – the client wants a conversational read. They specifically tell you that a non-announcer read required. But what flavor of conversation do they want? There are a lot of different ways to be “conversational.” Just listen to real people have a conversation. In fact, record yourself having conversations with different people. A lot of the nuances in just what conversational style will be right will come from the particular script you are reading, but Pam Turlow recently blogged about this subject and listed a few specific conversational “styles” that should help your taste buds get warmed up for your next non-announcer read. Just about 2-weeks now before FaffCon 2 – this time tagged with Electric Boogaloo – so I am trying to find appropriate clothes and platform boots. I do have a pair of macrame earrings from the 70’s so those are going into the suitcase. The trip to Atlanta will be a double treat because prior to the weekend conference, I will be able to spend some time with a friend who moved there several years ago. Hope that it warms up a bit there over the next week or so! No doubt, FaffCon 2 will have a completly different vibe* than the groundbreaking first unconference for working voiceover pros, but I am sure that information exchanged will be equally valuable – perhaps even greater in value because of the lessons learned. Prior attendees may be more prepared to lead and/or contribute to the posted sessions – and will be able to jump right into posting session topics and encouraging new attendees to do the same. If you are on your way, be sure to pack those business cards, comfy clothes and an open mind. Stop by the FaffCon 2 website to check out the session ideas that have been posted so far – and add one or two of you own on topics you want to know more about. Or perhaps you have some special area of expertise you want to share. In that case, be prepared to lead a session! You actually don’t have to know a lot about something to lead – you can just start the conversation and moderate. It really is free form chaos that somehow seems to work really well. Safe travels all and see you on the 25th in Hot-lanta! * Clarifying what I meant by “completely different vibe” – since there will be a different mix of people with different backgrounds and experiences and in a different place, the way everyone works together will simply be different. Perhaps the adverb “completely” is too strong a word. Yeah – too strong – let’s just go with different – but just as fun, just as informative, just as much of a bonding, growing experience as the first FaffCon. I didn’t coin this – fafftermath – but it is what is happening to at least some of the people who attended the first ever FaffCon in Portland OR, September 11 and 12, 2010. One of the things Amy, the organizer did near the end of the last day, was force everyone in the general session to answer some questions and write down some action items. This was so that we didn’t get back home and let life take over without capitalizing on the information that was shared and the energy that was exchanged and enhanced. I managed to walk off without my notebook and my notes – and all my remaining business cards, but I did remember at least one of my action items (or if it isn’t on the list when I finally do see it again, it is now! )…get in contact with old clients. So I have make it a point this past week to contact at least one lapsed client per day. And here’s what happened today. Just after parking the car outside the world famous San Diego Zoo to spend some time with my nephew who is finishing a cross country trip, I got an email from one of these former clients whom I had not worked with since 2008. I had sent him a note just a couple of days ago checking in and suddenly a job popped up for me. He followed up with a phone call and I explained that I was just going into the Zoo and asked him if this was a rush. Nope! So, off I went – playing Auntie the Tour Guide for several hours. When I returned to myh studio, there was a second job from the same client. Less than an hour later, I delivered the reads and got the billing info. Other examples of Fafftermath have popped up on some social media sites posted by other attendees. There just might be something to this peers sharing with peers concept!